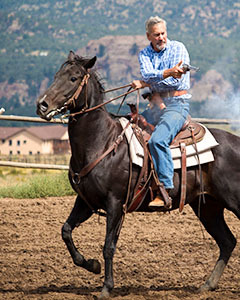 Support the Horsemanship program at the A/U Ranches with an annual or monthly gift. 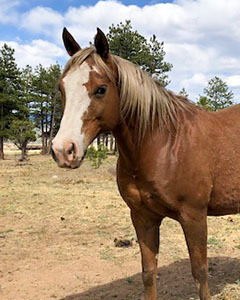 You have an opportunity to adopt one of the finest horses in all of Colorado for a year! The horse you choose to adopt will benefit greatly from your sponsorship – it will be fed, cared for and loved that extra mile with your support. Your annual gift of $1,800 or monthly gift of $150 provides hay, grain, shoeing, care and training for one year. The gratitude of every camper who rides your horse! To adopt your horse, contact Laura Lochen at 888.416.7348 x107 or email. Meet Millie! 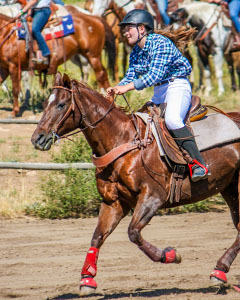 She’s a beautiful, athletic, chestnut Quarter Horse born right here at the A/U Ranches in 2008. Lachlan started her as a two-year-old. Now the campers are enjoying her. 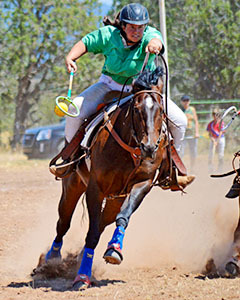 She excels in polocrosse, gymkhana and mounted shooting. Millie may be small, but she’s a powerhouse. She is one of our most dependable and talented performance horses on the ranch. Both campers and staff love her. This is our awesome Skeeter, another amazingly talented horse born here at the A/U Ranches. Lachlan trained her from the start, and now she’s a speed-demon extraordinaire. 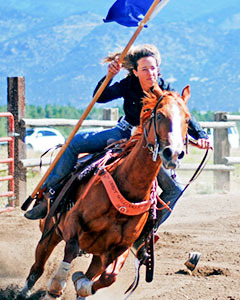 She likes to “get ‘er done.” Most likely the fastest horse in Chaffee County, Skeeter won the staff gymkhana in 2015. She’s sassy, spunky and an advanced rider’s favorite. Born May 18, we purchased the mother, knowing she was in foal. Because she was so close to her due date, we left her with the previous owners to foal because we did not want to have the stress of a new home for her. 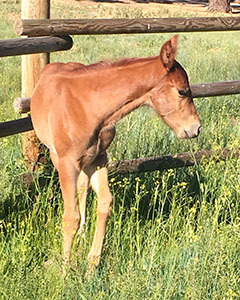 Mom and baby will be coming to the A/U Ranches this summer for all the staff and campers to enjoy. June 12, 2018 update: They’re here! Casey is a favorite for staff and camper alike. She can take care of newer riders and also perform at a high level for more advanced riders. She’s won the staff gymkhana twice and is a pro at polocrosse. Casey is truly an all-around, talented, solid citizen – she’s worth her weight in gold. Ranger was donated from previous corral staff, and, boy, was he a special gift. 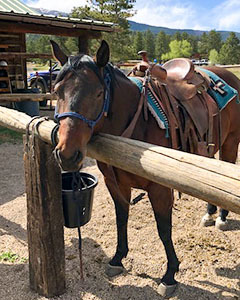 This dark bay Quarter Horse has taught many beginners to ride. He’s patient, gentle and loving. 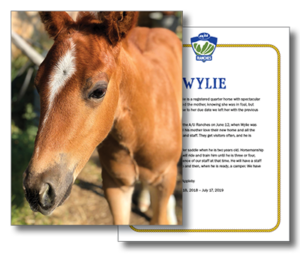 This is the kind of starter horse that makes campers fall in love with horsemanship and riding. Meet Madera, the matriarch of our herd. 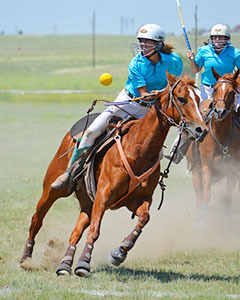 She’s a very talented polocrosse and gymkhana horse. 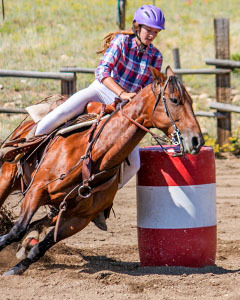 She’s got a lot of get-up-and-go, but at the same time is quiet enough for emerging riders to advance their skills without feeling overwhelmed. She’s taken many a rider to the next level. Here’s Joey. 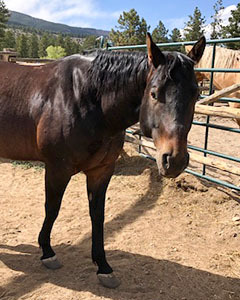 She is a large, gentle, dark bay mare – perfect for adults who need more “horse.” She’s a veteran pack trip horse and loves gymkhana. Joey is a truly solid member of our herd. Sloan is one of our younger horses. Our staff have been training her to join the upper elite of the polocrosse and gymkhana group. She’s on her way, having made great strides over the last couple of years. She’s a blast to ride – forward, spunky and full of herself! We love her. Six is another of the younger horses. He’s a blue roan, so sometimes he’s dark bay and other times he’s speckled white! He’s a stocky, gentle, easy ride. Lachlan has spent hours and hours in the saddle making him what he is today. He’s done parades, opened the gymkhana with the “posting of the flags” and is getting better and better every day at polocrosse and gymkhana events. Meet Torino! He was “cutting” bred, which means he has good moves on him. He can turn it on when he needs to. Torino is a go-to horse because he’s dependable, fun and talented. He’s great for all levels of rider and is also one of the prettiest horses we have! 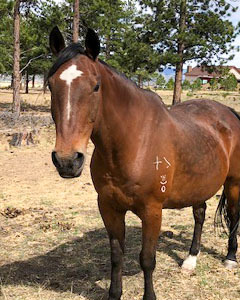 Rita is a big Quarter Horse mare that came to us as a three-year-old. 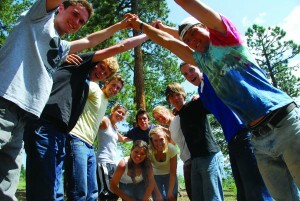 With a lot of training, she’s come a long way and is now a camper and staff favorite. Rita is feisty, athletic and loves a good challenge. Adopt your horse today! Contact Laura Lochen at 888.416.7348 x107 or email to get started.